I left the dance school yesterday with all my instructions from Mary Beth's teacher, Miss Mary. I knew where to sew the elastic and where to sew the satin ribbons. I knew who to request at the dance store for the fitting (only Esther was to be entrusted with this job). And just in case I didn't know, as I was leaving, Miss Mary reminded me of one more thing, "She's not a little dancer any more. Now she's a big girl." Ah, yes. Why is it this day seemed so far off way back when she was twirling for Miss Missy in my dining room? And so we arrived at The Cinnamon Tree. This was the dance store where I first purchased that outrageously expensive pink skirted leotard because I'd always wanted a little girl in a pink skirted leotard. At the time, Mary Beth was my only girl; a little pink angel in the midst of five brothers. On this day, I had another little girl by the hand and still another in my arms. 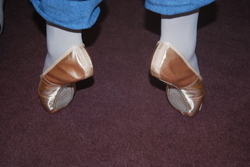 We walked through door, led by Mary Beth, her hair still pulled up from dance class, her back straight and her stride the unmistakable walk of a ballerina. She sat for her fitting and I snapped pictures. I noticed that Mary Beth was so excited the both her hands and her feet shook. And then, Esther held her hand and asked her to go up en pointe. Mary Beth did and I heard a collective gasp from the ladies in the shop. "You did that beautifully!" exclaimed Esther. 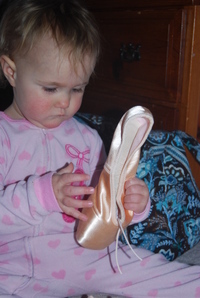 I will never know if such exclamations come with the purchase price of one's first pointe shoes, but my little girl ballerina flushed with joy. Two little girls took it all in, inspired once again by the truest heroine in their young lives. Katie will remember every detail of this day and she is likely to talk about it for the next six years until she claims a day like this as her own.She spent a good deal of time begging for a pink skirted leotard. Not this time, my girl. And Karoline. Karoline, who speaks very little English at this point, can do a pretty admirable passe, to go with her burre, her port de bras, and her arabesque. Karoline is a dancer in good company. And right now, she has in Mary Beth the best teacher in all the world.